In some cases the automatic demo import doesn’t work properly. This happens when the website is on a local server without an internet connection, or when its on servers that block data from external sources such as our servers. This is exactly why we’ve added the option of manually importing the demo content to your WordPress website. Click on “Demo Import – Manual Installation” to be brought to the import page. 2. Then enter the “My Account” area on our site > go to the “Downloads” page and download the ZIP file called “Demo Content” – you can find it below all the themes. 3. After downloading the file, extract its content into a folder on your computer. Please note that the main demo content is the English one. content.xml – This file is responsible for all of the site’s import: posts, pages, galleries, slideshows, store, menus and featured page. customizer.json – This file is responsible for all the Customizer settings import, so it should be identical to our demo. 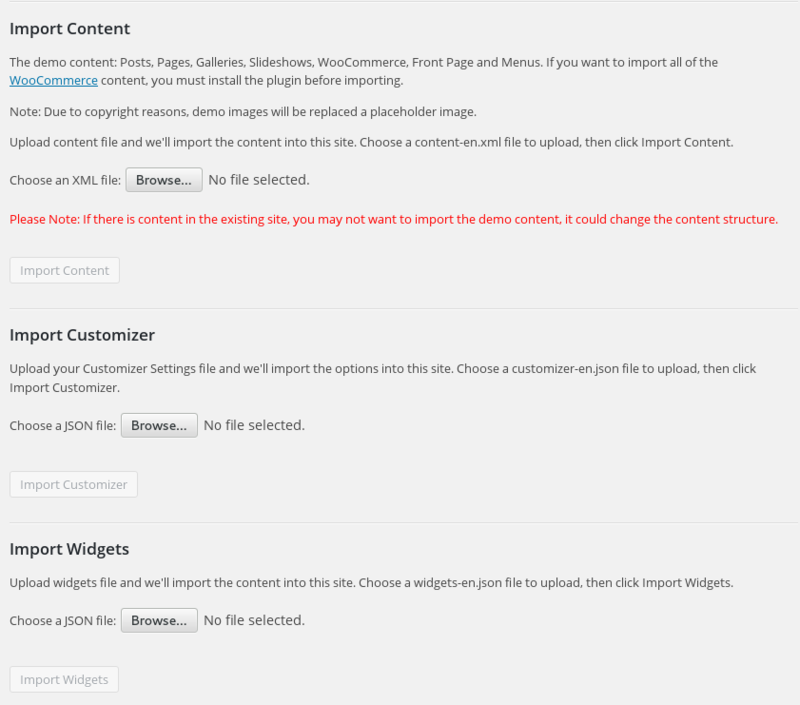 widgets.json – This file is responsible for the import of all the existing widgets on our demo to your site. Import every file in the area it belongs according to the import fields’ titles on the page. It’s very important to check that there is no existing content on the site (besides the default page and post that comes with the WordPress installation), otherwise the content can disappear. We recommend you import the demo only if there is no content on the site. Go to the Demo Import folder to which you downoladed the revslider where you’ll find ZIP files of all the demo sliders. 3. Select the ZIP file from the folder on your computer > Click again on the Import Slider button. The system will then import your slider.